A new form of creative expression or lacking in atmosphere? "There's definitely something about virtual reality that is very exciting on a creative expression level," says Ben Lovett, pianist and keyboard player in Mumford & Sons. The Grammy and Brit-Award winning (as part of the stadium folk-rock band) musician recently opened Omeara, a live music venue in Southwark, London. The focus will be on lesser-known bands, whose profiles Lovett hopes to boost. Part of that goal could be achieved by livestreaming shows to virtual reality headsets, a strategy that he is currently in discussions about. "One of the advantages of being in London is that you can go to places like Omeara in real life," he says, "If you live in a small village, bands probably aren't gonna come to you. But virtual reality means that people who don't live in big cities can vicariously enjoy a taste of what's going on here. "I think that will lead to greater inspiration and more culture – like when people tell the story that they watched Glastonbury on TV when they were 10 and that's what made them want to be a musician." Lovett is not the only one who's excited about the possibilities presented by the collision of virtual reality and live music. In May, NextVR, which has a record for streaming sports events – including boxing matches and the racing event Daytona 500 – teamed up with the live music promoter Live Nation. In a deal with Citi bank, the two companies will, before 2017, hold a series of virtual reality live shows with an as-yet undisclosed set of artists. Viewers will be able to watch the performances through the Live Nation Channel on the NextVR app. Hulu also has plans with Live Nation for a Gear VR series that lets users walk out onto a virtual stage during a concert. Earlier in the year, Universal Media Group and internet radio platform iHeartRadio announced a landmark deal to bring events such as The iHeartRadio Music Festival to virtual reality. This summer, the Californian festival Coachella partnered with Vantage.TV to send custom Google Cardboard VR headsets to punters in advance of the festival; this let them view performances and photos from past festivals in 360-degrees. There's no doubt that virtual reality has arrived in the music world. And it's true that some vicarious gig-goers may well be tempted by a cheaper alternative to expensive gig tickets for the likes of Adele and Beyoncé (discounting the initial $80 or so investment for, say, a Samsung Gear VR or Google Daydream View headset). But not everyone is convinced. Rhian Daly, a writer at music magazine NME, tells Wareable: "The whole point of live music is being there in the room with your favourite bands and a crowd of likeminded people, and the feelings that come with that. "Watching gigs on TV or YouTube very rarely communicate the electric atmosphere or sheer thrill of the occasion," she says. "The novelty factor of watching a concert in virtual reality might be exciting at first, but no amount of technology can eradicate the knowledge that you're not actually there, experiencing it firsthand." Mativision, a company based in Athens, London and New York, has been working in VR and 360 degree videos for 10 years. 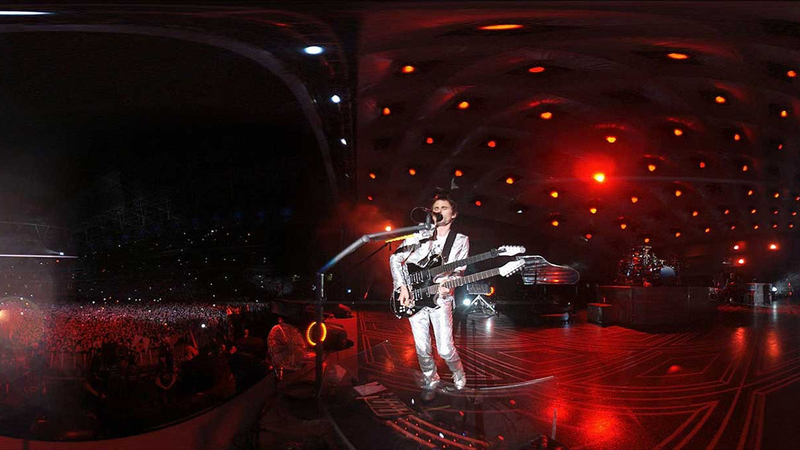 It filmed Muse in 360-degrees at Wembley way back in 2010. This February it partnered with Samsung to showcase the capabilities of the Gear VR with a live show from the pop band Years & Years, who performed at London's The Hospital Club. George Kapellos, head of marketing and partnerships at Mativision, refutes the idea that the combination of VR and live music is a simply a fad. "People are talking about VR as the next computing platform. One of them is Mark Zuckerberg," he told us. "I attended Oculus Connect in San Jose, where he did a demo of him being in a virtual reality space and connecting to his colleagues. If the big brands believe that this is where things are going to start happening in the next five to 10 years, then it's very difficult for it to become a fad." Kapellos does, though, concede that virtual reality can never replace the live music experience: "I would agree [that you can't replicate the atmosphere at a gig] but that doesn't mean that people don't want to experience something as virtual reality. Sometimes technology covers a need that is out there, but sometimes it creates a new need that wasn't there before." Kapellos predicts that virtual reality will create a "new need" for music lovers by offering a "teaser" for upcoming live shows. This could be reassuring to record labels that fear VR's potential to syphon off their already squeezed profits. He argues that if a London-based fan enjoys watching, for instance, a VR broadcast of The Rolling Stones performing in Argentina, they're more likely to pay to see the band play the UK capital at a later date. In this scenario, it could be lucrative to make even one date from a world tour available in VR. It's an argument that live promoters should find compelling. But there's a problem: across the board, commentators agree that cameras are not currently at a high enough standard for VR livestreaming to match the quality of television. YouTube, Samsung and NextVR are among the companies on a mission to combat the issue. According to Kapellos, it won't be a problem for much longer. "Mativision is working on this with a camera manufacturer at the moment," he says. "High-quality cameras and 360-degree cameras are coming. The quality of livestreamed virtual reality will be very close or even better than the 4K quality you get in your TV. I think that will be coming in January. And then you will start to have a new set of content that will be made specifically for virtual reality – that could be concerts and music videos made specifically for VR. "The more people come onto VR, the more content has to be created for them," he adds. "If [a musician does] a show now, they usually do a documentary or a live broadcast. In the next couple of years, there will also be a virtual reality piece of content created out of that concert." It seems, then, that – in an extension of what Ben Lovett is excited about – the collision of virtual reality and live music could inspire a whole raft of creativity across both worlds, providing different technologies can keep apace.